A key prog which arrived a day early this week. Thank you, Mr Tharg. Cracking cover by Cliff Robinson with Dylan Teague's colours being the star for me. Dredd: The Small House wraps up in 8 pages with a new iconic Dredd panel by Williams, Flint, Blythe and Parkhouse. "This is my house!" Brink. I don't know what she's doing but I'm fascinated to find out. A Le Carre triple cross in a space tincan? The Spy who came in from the Cold Equations. Sinister Dexter returns with a voyage to the bottom of the sea and 10 pages. Kingdom: Alpha and Omega continues with the Abnett droid writing 3/4 of the prog and the last page ad is for his Lawless strip in the Meg as well. A cracking prog with a superb Dredd moment. Has that page gone already, Wiggz? Good prog. Chekhov's gun in full effect in Dredd, but a satisfying moment nonetheless. "The Small House" has been thoroughly enjoyable with a few great moments, but I think I'll be waiting to see if it lives up to the promise of shaking things up in Dredd in the epilogue and subsequent stories in 2019. Jury is definitely out on that for now. Interesting to note that Frank's fate is handled in a single balloon in a single panel - it wouldn't be out of keeping with Rob Williams' writing to have that be it (and Frank's tale comes to a satisfying end if it is) but the old "if you don't see the body" saying does come to mind. Brink rumbles on in intriguing fashion, and both Sin/Dex and Kingdom are great. Dan Abnett's productivity is astounding, made more so by the level of quality he's holding his work here and elsewhere at. Not sold on John Charles' colouring on Sin/Dex. It's good work, but in places it feels like it's obscuring Yeowell's linework. On some panels I'm not sure whether I'm looking at Yeowell adding pencil shading to his inks or something the colourist has added and the end result in some places is a very "fuzzy" effect that isn't very pleasing. I've enjoyed his colours on other Sin/Dex strips so maybe there was just a wobble here, or some experimentation that didn't quite work. Not one for a quick reading. As for the ramifications, fair point. I think Rob Williams is keeping his options open. If we never see Frank again, then he died in this story, and he got a very good send-off. But Hershey could be lying. Personally I hope he's dead because it's such a good way for him to go out. There's some debate on last week's prog thread about different Dredd writers ignoring each other's work and doing their own thing, in particular with Hershey. But given where Wagner went with Harvey last year, I wonder if the latest developments are more co-ordinated than we realise. Matt Smith could know what's coming up in Hershey's Wagner-ordained future and has briefed the other writers accordingly. I thought Kingdom was going to end this week, so I'm glad there's going to be a bit more. I also thought a few weeks ago that this might be the last book of this series, but clearly there's still more to come. 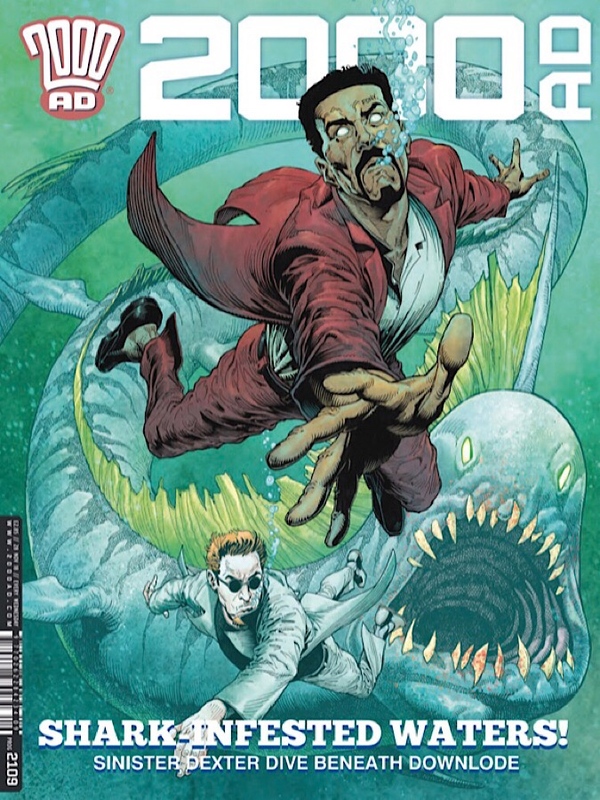 This is still one of the best series in 2000AD. After a couple of episodes of talking heads, Brink picks up again, and I'm still hooked. I disagree with the criticism of the art in SinDex, it looks fine to me. In fact, I prefer it. Do we know why we've had to wait 11 years for the end of Caballistics (which returns in prog 2111)? That's an even longer wait than Nemesis. And I can't remember what was happening, can anyone who's recently read it please remind us? All of those criticisms are completely valid and I agree with all of them, yet I still enjoyed the story in spite of them. So RW must be doing something right. Yay! The Invisible Ninja Hidden Judge Army era of Dredd is officially over. We all seem to agree that Williams's writing is great, and you only have to read previous threads to see that the strip is working on every level for most readers. What Remoaners are discussing is really just a problem inherent to properties media organisations see as permanent fixtures, rather than finite works. See previous. Re: what’s been happening in Caballistics Inc, I went into the loft this morning to dig out the last episode ‘Nativity’ from 2007. Basically, following Kostabi’s supposed final defeat, the authorities, including Absolam, are worried that he might reappear in Ravne and Demon Jenny’s child, yet to be born, so they are hatching a plot to deal with that. The story ends with a 19th century British soldier being reanimated in Sudan, in order to carry out a job, as yet unspecified (though it may relate to the above). No word on the critically injured Chapter and Verse. In my head I’d thought the story had been fairly well concluded, though reading this, it clearly hasn’t! Coming in Feb next year is Judge Dredd Machine Law by John Wagner and Colin MacNeil. This sounds very much like the return of Harvey. So most likely Hersey will still be around. Coming in Feb next year is Judge Dredd Machine Law by John Wagner and Colin MacNeil. This sounds very much like the return of Harvey. Thanks for that, bud. I'd been looking forward to McCreaman returning to that story; only the great Colin MacNeil could make his replacement a cause for celebration. Partially that's the problem, but I think the issues I have with Williams writing here are more fundamental - the Gerdhart "revelation" would fail on its own merits, let alone on top of Dredd having to call in teacher to take out the bullies. At that point, any one of a thousand Judges could ahve pulled that trigger, but that wouldnt ahve been as "cool". There are other gaping plot holes ("all our ninja judge detecting tech has been stolen!" or contrivances that have nothing to do with restraints on a franchised character - if Dredd HAD had a good strategy to screw over Smiley, that would have been a fist pumping moment. All he really did was blunt force -maybe it woudl ahve been better is Dredd had just bludgeoned him to death - "how's THIS simple tool working out for you?" I agree Williams has written some good Dredds, though for my money, not his long form ones. ... maybe it would have been better if Dredd had just bludgeoned him to death - "how's THIS simple tool working out for you?" That's 'the essence of Dredd'! Deadline for script submissions is March next year, Leigh. Thanks for the recap, Southstreeter. In fairness to Rob W, I should say here that Gerhart was last seen in episode 3 of The Small House, so it's not as bad as I thought.